What a year this young couple has had! Twelve months ago they were a blip on the UK Country Music radar but this album, released in March has blasted them into an orbit that is now getting them noticed in Planet Nashville itself. Well for what it’s worth; even if they’d only released opening track Tonight as a single they could have been proud of themselves; because it’s a doozy! The slow burning love song features some delightful guitar picking and their harmonies are so good you could drown in them; but when the chorus kicks in you know you are listening to something really special indeed. We get our first taste of ‘twang’ on the opening to next song Nashville Grey Skies, which is the best Nu-Country song not to come out of Texas or Tennessee in donkey’s years. It’s very easy on the ear and will seamlessly fit onto Country radio in the US of A but when you decipher the lyrics the song is about the likes of me; who love Country Music but live thousands of miles away. My wife’s favourite song has quite rightly received a lot of airplay in the UK and Europe (even getting onto the coveted A-List on BBC Radio 2) as the chug-a-lug beat carries on where Dolly’s 9-5 and the Coyote Ugly soundtrack left off. If you are reading this outside the UK and think you ‘like a drink’ at the end of the week; trust me you ain’t seen nothing like we Brits at the end of a week! The Shires ode to partying on Friday Night hits every single nail on the head and all played out to a danceable beat. While Ben Earle and Crissie Rhodes most certainly have their feet in America their hearts are most definitely still very English; as the beautiful Made in England proves. A love song to their home country is a rarity in itself; but avoiding jingoism is virtually unheard of; but they manage it with skill and class. How many songs have you heard that talk about the singer’s love for milky tea, beer in a pint glass, grey skies and fish and chips? Never I’d guess; but I urge you to hunt this one down, it’s worth it. 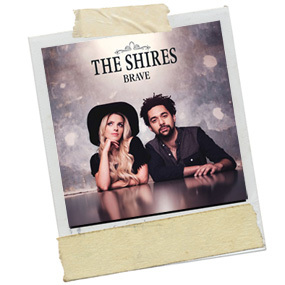 In the best traditions of Country Music the Shires take us on an emotional roller-coaster; especially with their love songs; and boy….can they write a love song! In our house it was the delightful State Lines that drew the band to our attention; and we couldn’t believe the band weren’t All American Kids; yet when you actually listen to their enunciation they don’t even sound ‘American’ – how cool is that? If I have to pick a ‘best in show’ it will have to be a tie; simply because both songs ooze quality song-writing and the finished article sounds like they have been around for decades not months. I Just Wanna Love You straddles a fine line between early Vince Gill and latter day Fleetwood Mac, while Black and White opens with a soft piano intro that could be a finger running down your neck and when Crissie purrs the words you will go week at the knees. A beautiful song on many levels; and you can’t help but smile when you listen to the song while looking at their picture on the cover. There you have it; I’m a convert and with several other young contemporaries waiting in the shadows; perhaps we are on the verge of a British Country Invasion of both the USA and the UK.